Richelieu Rock, which only breaks the surface at low tide, is an underwater photographer heaven (photo: Kara Murphy). If you’re after more peaceful (less touristy) dive sites then Ko Ha in the south-east Andaman Sea if for you (photo: Kara Murphy). 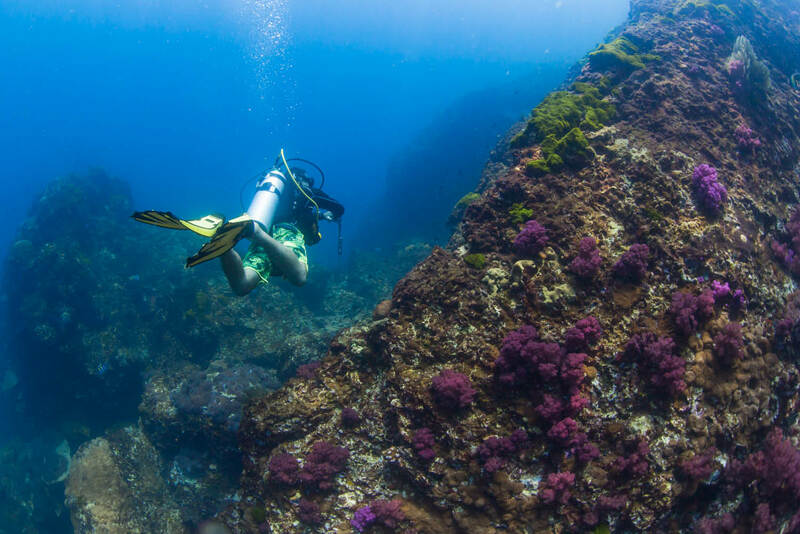 Ko Ha’s six dive sites include the Cathedral and the Chimney (photo: Kara Murphy). The exquisite hard coral gardens, thrilling swim throughs and caverns of Ko Ha (photo: Kara Murphy). 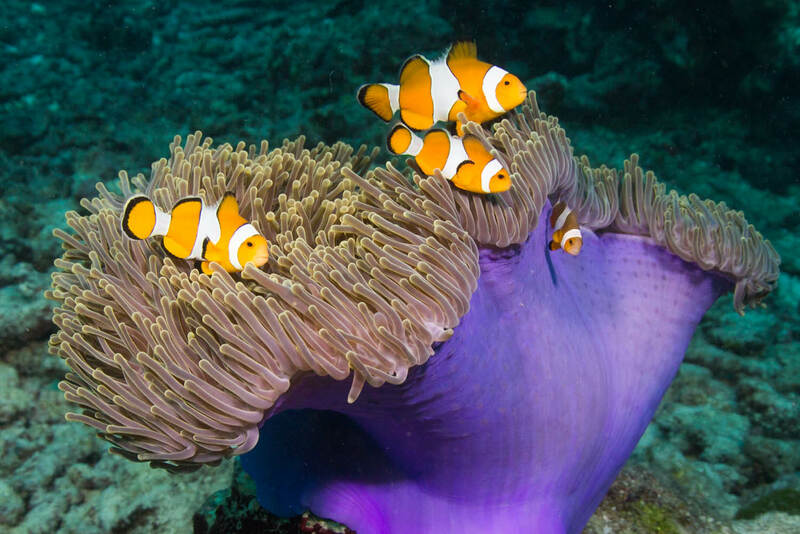 Anemonefish (clownfish) clowning around under the Similan Islands (photo: Kara Murphy). There are an underwater abundance of Southern Thailand scuba diving and snorkelling sites. 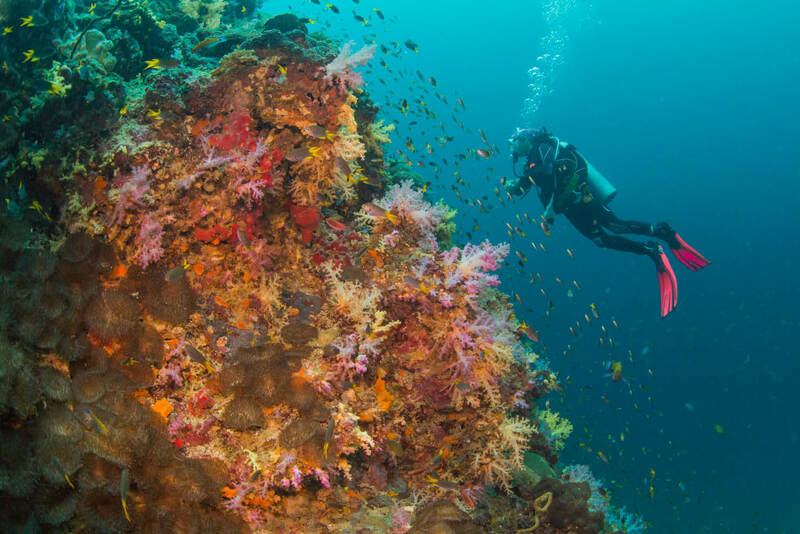 With so many options, how do you choose your best Andaman Sea adventure? Here are Kara Murphy’s best of the best. With warm water temperatures (usually 27 to 30°C) and underwater terrain that includes swim throughs, caves, caverns, pinnacles, boulders that appear to have tumbled from islands to the sea floor, and ethereal karst islands surrounded by coral, Southern Thailand offers enticing opportunities for scuba divers and snorkellers. 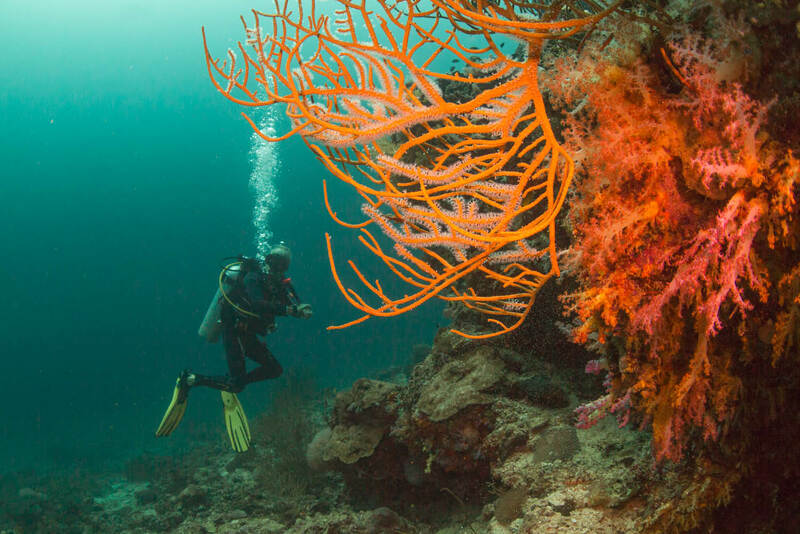 With several notable diving areas, how do you choose which is right for you? Check out our guide below as you decide where – and when – to go. About 50 kilometres west of Khao Lak is Mu Ko Similan National Park, named for the park’s original nine granite boulder islands. Today, the park includes 11 islands, including Ko Bon and Ko Tachai to the north. Together, the boulder seascape, coral, and clear waters create a dreamy environment. Snorkellers linger above rocks decorated with soft corals and anemones, while divers descend towards Anita’s Reef/Hin Muan Deaw (‘whole roll of film rock’), cloaked in soft corals and sea fans, as well as more advanced sites such as Ko Bon’s West Ridge, a manta ray cleaning station where staghorn and brain corals, yellow soft corals, and schools of reef fish and trevally compete with rays for attention. Tip: Don’t arrive seeking solitude. If you’re on a liveaboard, you’ll probably enjoy some tranquil moments after the day-trippers depart; otherwise, expect the more popular sites to be crowded. When: December through April (the park is closed from mid-May through mid-October); March and April are best for manta rays. Where: Khao Lak (in Phang-Nga province, about 80 kilometres north of Phuket airport) is the closest tourist area to Thap Lamu pier, the main departure point. Drift past vibrant pink, red, and violet corals, pausing to spy on hawksbill turtles, groupers, puffer fish, scorpion fish, moray eels, anemones, mantas, and more at Richelieu Rock, a flat, horseshoe-shaped limestone rock that only breaks the surface at low tide. Heaven? In spite of the other boats around, pretty much. And especially for underwater photographers, as the colours and diversity of marine life make this spot – north of the Similans and part of Mu Ko Surin National Park – a favourite. Thanks to the depth range (five to 35 metres) and potentially strong currents, it best suits intermediate to advanced divers. Snorkelling isn’t advised. Tip: Some operators offer day trips, however, on multi-night liveaboards, you’ll probably dive this site at least three times and experience the Similans as well. Where: Liveaboards depart from Thap Lamu pier near Khao Lak and Chalong Pier in south-eastern Phuket. Ko Bida Nok and Ko Bida Nai, two small islands to the south of the main Phi Phi islands, are both popular diving and snorkelling sites with sloping reefs and walls. The former is renowned for its large schools of snappers, while the latter is rich with anemones, angelfish, stingrays, and hard and soft corals. 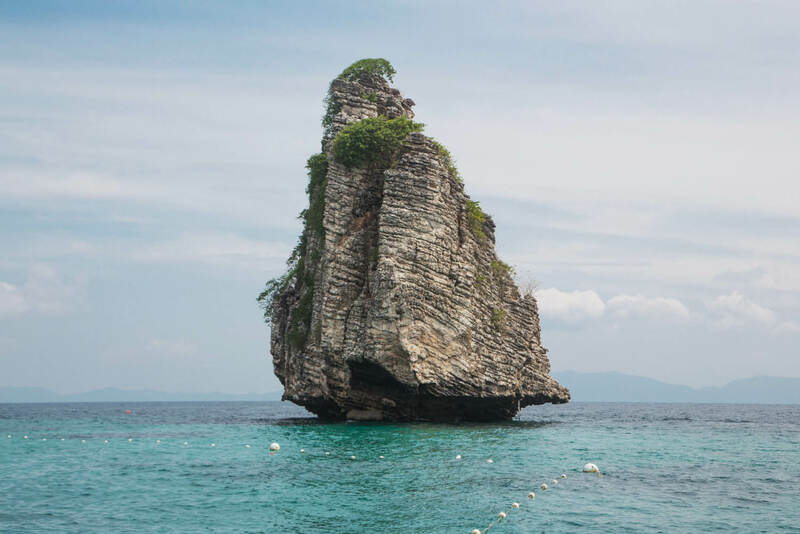 Around Phi-Phi Leh, Turtle Rock (where hawksbill turtles are frequently spotted) and Viking Cave (an artificial reef) are also good choices; like most sites here, they’re suitable for beginners. Tip: Phi Phi’s sites tend to be quieter in the afternoon. When to go: Year-round (although the best visibility is between February and June and the best snorkelling between January and April, says Avery). Getting there: Day trips depart from Chalong Pier in south-eastern Phuket. If you’re craving more peaceful dive sites (and a less touristy base), venture further south-east. Ko Ha – five beautiful limestone islands blessed with hard coral gardens, caverns, and thrilling swim throughs – is just an hour away from low-key Pak Meng Beach (Trang province) via speedboat. Ko Ha’s six sites include the Cathedral, where you can surface within blue-lit caverns; the Chimney, a semi-daunting vertical swim through with an entry at four to five metres and an exit at 17 to 19 metres; and the Lagoon, which attracts plenty of snorkellers, predominantly on day trips from Ko Lanta. Other possibilities include Ko Rok Nok and Ko Rok Nai, also an hour from Pak Meng and featuring pristine hard corals, and, closer to Pak Meng, Ko Waen and Ko Kradan, which – with their flabellinas, other nudibranchs, and reduced visibility – are best suited for macro photography. Hin Daeng (‘Red Rock’) and Hin Muang (‘Purple Rock’) – two remote submerged rocks, the latter bathed in soft purple corals and both attracting barracuda, tuna, trevally, grey reef sharks, and mantas – are options for intermediate to advanced divers; however, to make the significantly longer journey there, sea conditions and currents must be ideal. Tip: For proximity, visibility, and beauty, Ko Ha is a wonderful south-eastern choice. Where: Day trips depart from the luxurious Anantara Si Kao near Pak Meng Beach, about 1.5 hours south of Krabi airport. Sea Bees Diving operates day trips and/or liveaboards to all the above sites.